On the death of Dr. Humfrey Gower, who left him a country-seat at Thriptoe, worth 20l. 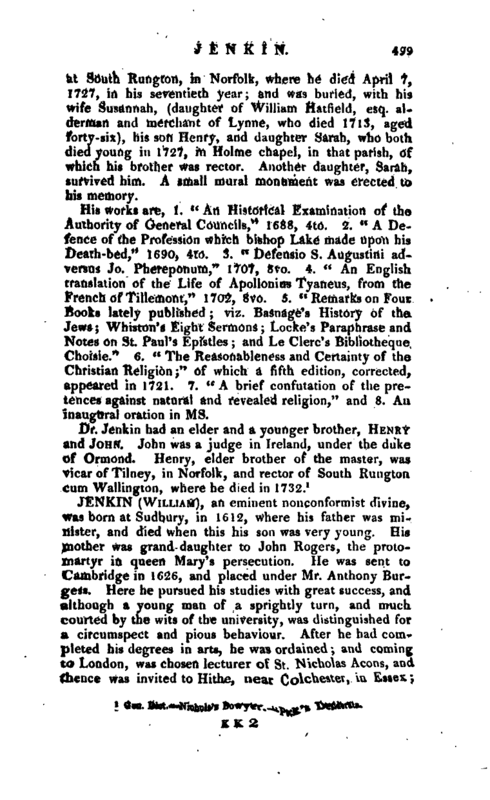 per annum, on the death of Mr. West, his nephew and heir; and 500l. to buy a living for the college, to which society he also left two exhibitions of 10l. each, and all his books to their library. 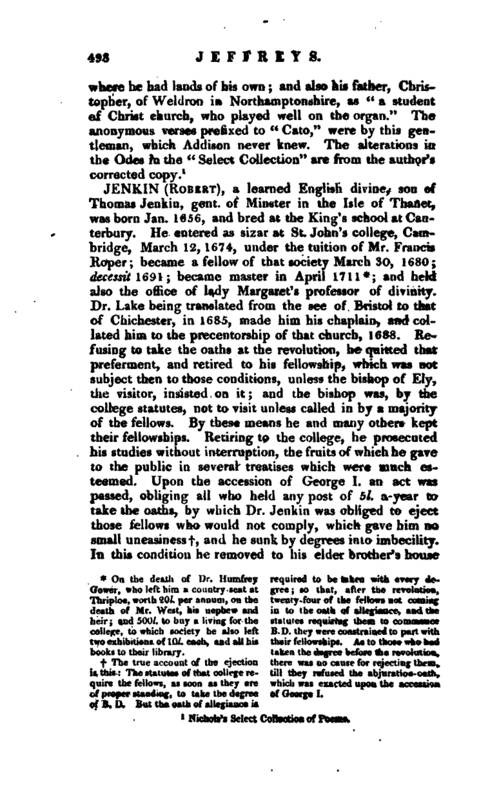 The true account of the ejection is this: The statutes of that college require the fellows, as soon as they are of proper standing, to take the degree of B. D. But the oath of allegiance is required to be taken with every degree; so that, after the revolution, twenty-four of the fellows not coming in to the oath of allegiance, and the statutes requiring them to commence B.D. they were constrained to part with their fellowships. As to those who had taken the degree before the revolution, there was no cause for rejecting them, till they refused the abjuration oath, which was exacted upon the accession of George I. | at South Rungton, in Norfolk, where he died April 7, 1727, in his seventieth year; and was buried, with his wife Susannah, (daughter of William Hatfield, esq. alderman and merchant of Lynne, who died 1713, aged forty-six), his son Henry, and daughter Sarah, who both died young in 1727, in Holme chapel, in that parish, of which his brother was rector. Another daughter, Sarah, survived him. A small mural monument was erected to his memory. His works are, 1. “An Historical Examination of the Authority of General Councils,” 1688, 4to. 2. “A Defence of the Profession which bishop Lake made upon his Death-bed,” 1690, 4to. 3. “Defensio S. Augustini adversus Jo. Phereponum,” 1707, 8vo. 4. “An English translation of the Life of Apollonius Tyaneus, from the French of Tillemont,” 1702, 8vo. 5. “Remarks on Four Books lately published; viz. Basnage’s History of the Jews; Whiston’s Eight Sermons; Locke’s Paraphrase and Notes on St. Paul’s Epistles; and Le Clerc’s Bibliotheqne Choisie.” 6. “The Reasonableness and Certainty of the Christian Religion;” of which a fifth edition, corrected, appeared in 1721. 7. “A brief confutation of the pretences against natural and revealed religion,” and 8. An inaugural oration in ms.
Gen. Dict. Nichols’s Bowyer. -Peck’s Desiderata.